It may sometimes seem as if everyone has a blog. Is this a good idea for your company as well? It's true that in the early days of blogging, the contents of these electronic journals were very much vanity projects, and about as exciting as reading somebody's diary. But then a funny thing happened to blogs. Bloggers realized that people just weren't that excited reading about mundane goings on, and to keep readers blogs would have to evolve. And so blogs moved from the adventures of the writer's cat to a site with general information on cats. Or child or car care, among many other topics. And readership grew. And businesses took notice. For they saw in the lowly blog a way to draw audiences to and promote their businesses at low cost. And by updating blog information frequently, they were guaranteeing themselves a regular audience of not just readers but potential customers as well. Who, if they were excited enough about the blog, would recommend it to yet more reader/customers. And today, everyone from exterminators to swimsuit companies have blogs on their websites. General contractors would do well to follow suit. Ah, but what should a contractor blog contain? A good contractor blog should be primarily informative (self-promotion is permitted, but don't overdo it), frequently updated (at least bi-weekly), and most importantly, cover topics that people want to read about. Below, are some construction blog ideas for yours. To stay ahead in business, one needs to know what's coming next. Topics here can range from materials to best practices, to changes in standards and technology. Example post: How Will Virtual Reality Change Construction? Ours is a profession in which a working knowledge of legal matters is very useful, and topics here can range from terminology to the proper filing of paperwork, to legal changes that can affect work. Example post: Use Technology to Ward off Litigation. The sky's the limit here, with endless possibilities ranging from clothing and equipment to devices, to training, to cultural understanding. 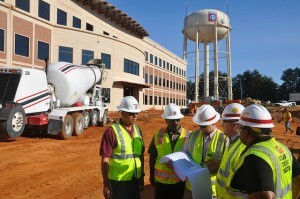 Example post: Help Construction Superintendents Put Safety First. Lots of potential here, as well. Topics can cover software, devices, equipment, trends, tutorials, and buying guides. Example post: 5 Ways to Improve Technology Adoption on Construction Sites. Lots of required and recommended industry training can either be found or at least registered for online, but many managers don't know how to find this or even what subjects are offered. Much of this can be offered at low or even no cost, and there's a big potential audience for this type of information. Example post: Construction Training Ideas for your Crew. Other good blog topics? "Green" is certainly the word. For instance: Why Building Green Is the Way to Go as is ongoing worker shortages, plus all this infrastructure job talk, not to mention the latest stats on construction jobs in general. So consider adopting a blog. If you want to know about it, so do others. Your good blog won't just lead to readers, but potential customers as well.